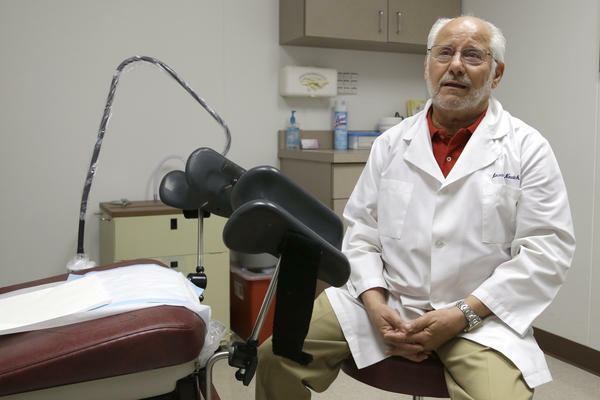 Dr. Howard Novick says new abortion restrictions in Texas could force him to close the Houston clinic he opened in 1980. He says he doesn't have the more than $1 million required to convert his office into a surgical center with wide corridors and sophisticated airflow systems. A judge has temporarily blocked a North Dakota law that would have banned abortions beginning around six weeks, when a fetal heartbeat is detectable. It's one of several state laws passed this year intended to limit abortion. Those backing the new rules say they will make abortions safer. But abortion-rights advocates say the laws are about politics, not safety. In Texas, Gov. Rick Perry signed a bill this month that increases requirements for clinics and doctors who perform abortions in that state. "At the end of the day, House Bill 2 makes sure anyone performing abortions in Texas is doing so in a facility that meets appropriate safety guidelines, and that people there are prepared to handle any emergencies that might occur. That is reasonable," Perry said at the signing ceremony. The Texas law bans abortions at 20 weeks and requires doctors to have admitting privileges at local hospitals. It also says clinics must meet the same standards as outpatient surgical centers. Several states have passed similar laws. State efforts to regulate abortion facilities have intensified since the Kermit Gosnell case in Philadelphia came to light. Gosnell was convicted in May in the death of one woman and three infants who had been born alive. Gosnell ran an illegal practice and adhered to no state regulations — yet the case is a rallying point for many who oppose abortion. "If Gosnell's clinic had been held accountable to the kinds of laws that regulate medical facilities, that woman might not have died," says Kristi Hamrick, a spokeswoman for Americans United for Life. Dozens of complaints were filed against Gosnell, but state officials didn't follow up on them. Hamrick says clinics that perform abortions should meet the same standards as outpatient surgical centers. "When we are looking at abortion surgery, we are looking at something that involves medical equipment, anesthesia, something that involves a medical event," she says. "And it should be treated like the medical event the abortion industry claims that it is." But according to the Guttmacher Institute, which tracks abortion in the U.S., the risk of complications is minimal. Fewer than one-half of 1 percent of patients have a complication that requires hospitalization. Dr. Barbara Levy, vice president for health policy for the American Congress of Obstetricians and Gynecologists, says decisions about care should be based on scientific evidence. "We're solving a problem that doesn't exist," Levy says. Laws mandating that clinics become surgical centers create a separate standard of care, she argues — one that's higher for abortion than for other common procedures with similar risks. "The data support a very safe environment for doing them in an office setting," Levy says. "That's true for giving injections. It's true for cervical biopsies. It's true for colonoscopy, and there's no evidence for a problem." Missouri, Pennsylvania, Virginia and Texas are the states with the strictest clinic rules. So far, at least three clinics in Pennsylvania and two in Virginia have closed. The specifications for surgical centers include the widths of hallways, the size of janitorial closets, the number of parking spaces and even the installation of hospital-grade ventilation systems. Alena Yarmosky, advocacy and communications manager for NARAL Pro-Choice Virginia, says that state's largest abortion provider recently closed because of Virginia's new law. "We feel that these statewide regulations really were the straw that broke the camel's back," she says. "They were just simply unable to ... relocate themselves into a building that would comply with these regulations." Another effort gaining momentum is regulating doctors who perform abortions. Some states require clinics to have transfer agreements with hospitals to handle complications, but others are enacting laws that require doctors to have admitting privileges at a nearby hospital. Emily Horne with Texas Right to Life says doctors should follow their patients in an emergency. "And the idea is that there would be some continuity of care, and the doctor that saw her for her abortion would be able to assist or provide medical expertise and knowledge and background for that woman if there was a complication." But abortion-rights activists say hospitals already accept emergency patients whether or not a doctor has admitting privileges. And hospitals don't have to grant those privileges. In some states, like Mississippi, they've been unwilling to do so. Levy says clinics need an emergency plan, but not admitting privileges. "These states that are passing these laws are being driven by politics," Levy says. "They're being driven by ideals, but not by science and evidence." Nine states now require providers to have admitting privileges, but several of these laws are being challenged in court. Meanwhile, dozens of clinics in Texas and across the country are figuring out whether they can renovate or relocate — or whether they may have to close. From NPR News, this is ALL THINGS CONSIDERED. I'm Melissa Block. Fierce debates over abortion are playing out in states around the country as some legislatures impose new, strict laws. In North Dakota yesterday, a judge temporarily blocked a new law that would ban abortions beginning around six weeks, when a fetal heartbeat is detectable. And in Texas, Gov. Rick Perry recently signed a bill that increases requirements for clinics where abortions are performed, and the doctors who perform them. Texas is not the only state to pass a law like that one, arguing that it will make abortions safer. NPR's Kathy Lohr examines that claim. KATHY LOHR, BYLINE: Texas is the most recent state to pass restrictions after a lengthy battle and an emotional, 11-hour filibuster by abortion rights activists. Gov. Rick Perry signed the bill last week. GOV. RICK PERRY: At the end of the day, House Bill 2 makes sure that anyone performing abortions in the state of Texas is doing so in a facility that meets appropriate safety guidelines, and that people there are prepared to handle any emergencies that might occur. That is reasonable. LOHR: The Texas law bans abortions at 20 weeks. It also requires doctors to have admitting privileges at local hospitals, and says clinics must meet the same standards as outpatient surgical centers. State efforts to regulate abortion facilities have intensified since the Kermit Gosnell case in Philadelphia came to light. He was convicted in the death of one woman, and three infants who were born alive. Gosnell ran an illegal practice, and adhered to no state regulations. Yet the case is a rallying point for many who oppose abortion. KRISTI HAMRICK: If Gosnell's clinic had been held accountable to the kind of laws that regulate medical facilities, that woman might not have died. LOHR: Kristi Hamrick is a spokeswoman for Americans United for Life. Dozens of complaints were filed against Gosnell, but state officials didn't follow up on them. Hamrick says clinics that perform abortions should meet the same standards as outpatient surgical centers. HAMRICK: When we're looking at abortion surgery, we are looking at something that involves medical equipments, anesthesia - something that involves a medical event. And it should be treated like the medical event the abortion industry claims that it is. LOHR: But according to the Guttmacher Institute, which tracks abortion in the U.S., the risk of complications is minimal. Fewer than one-half of 1 percent of patients has a complication that requires hospitalization. Dr. Barbara Levy is with the American Congress of Obstetricians and Gynecologists. She says decisions about care should be based on scientific evidence. DR. BARBARA LEVY: We're solving a problem that doesn't exist. LOHR: Levy says laws mandating that clinics become surgical centers, create a separate standard of care - one that's higher for abortion than for other common procedures with similar risks. LEVY: The data support a very safe environment for doing them in an office setting. That's true for giving injections. It's true for cervical biopsies. It's true for colonoscopy. And there's no evidence for a problem. LOHR: Missouri, Pennsylvania, Virginia and Texas are the states with the strictest clinic rules. So far, at least three clinics in Pennsylvania, and two in Virginia, have closed. Here's why: The specifications for surgical centers include the widths of hallways, the size of janitorial closets, the number of parking spaces, and even the installation of hospital-grade ventilation systems. Alena Yarmosky, with NARAL Pro-Choice Virginia, says that state's largest abortion provider recently closed because of Virginia's new law. ALENA YARMOSKY: And we feel that these statewide regulations really were the straw that broke the camel's back. They were just simply unable to locate - relocate themselves into a building that would comply with these regulations. LOHR: Another effort gaining momentum is regulating doctors who perform abortion. Some states require clinics to have transfer agreements with hospitals, to handle complications. But others are enacting laws that now require doctors to have admitting privileges at a nearby hospital. Emily Horne, with Texas Right to Life, says doctors should follow their patients in an emergency. EMILY HORNE: And the idea is that there would be some continuity of care; and the doctor that saw her for her abortion would be able to assist, or provide medical expertise and knowledge and background for that woman, if there was a complication. LOHR: But abortion rights activists say hospitals already accept emergency patients whether or not a doctor has admitting privileges, and hospitals don't have to grant privileges in some states. For example, in Mississippi, they've been unwilling to do so. Dr. Barbara Levy, with the American Congress of Obstetricians and Gynecologists, says clinics need an emergency plan, but not admitting privileges. LEVY: You know, these states that are passing these laws are being driven by politics, they're being driven by ideals; but not by science and evidence. LOHR: Nine states now require providers to have admitting privileges, but several of these laws are being challenged in court. Meanwhile, dozens of clinics in Texas, and across the country, are figuring out whether they can renovate or relocate, or whether they may have to close. Kathy Lohr, NPR News. Transcript provided by NPR, Copyright NPR.